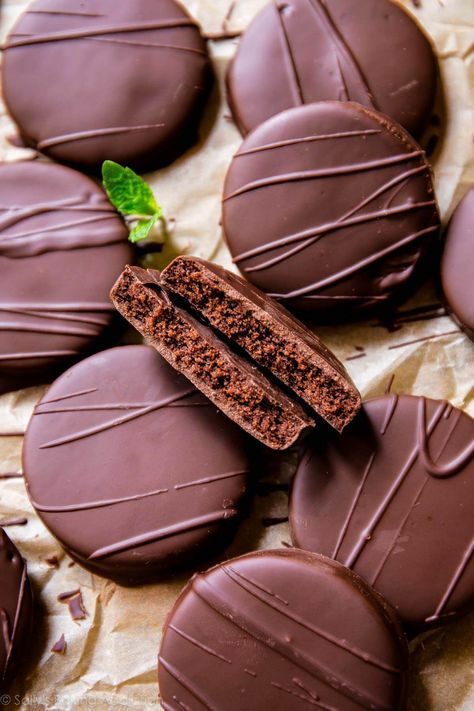 Copycat thin mint cookies for when you have a craving and there's no box to be found. Try them cold or out of the freezer-- they're incredible! 1. Make the cookies: In a large bowl using a hand-held mixer or stand mixer fitted with a paddle attachment, beat the butter for 1 minute on medium speed until completely smooth and creamy. Add the granulated sugar and beat on medium high speed until fluffy and light in color. Beat in the egg, vanilla extract, and peppermint extract on high speed. Scrape down the sides and bottom of the bowl as needed. 2. Sift the flour and cocoa powder together in a medium bowl. Whisk in the baking powder and salt until combined. On low speed, slowly mix into the wet ingredients until combined.